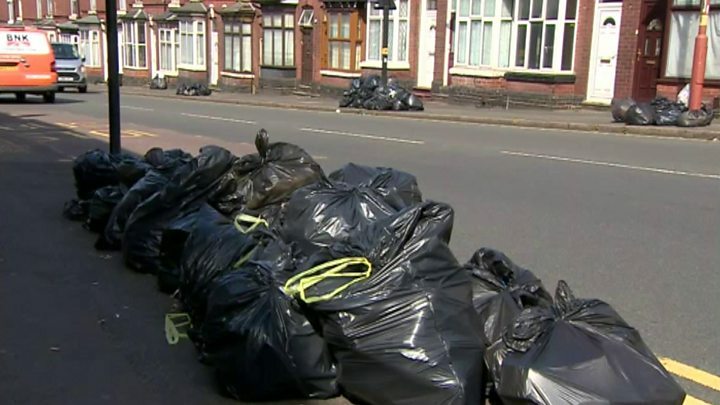 Refuse workers in Birmingham are set to strike until September, trade union Unite has announced. Daily two-hour stoppages will be increased to three hours from 28 July after talks with the council failed. Unite says the council are cutting over 120 jobs and claims members received their notice letters at the weekend. Birmingham City Council said it was "disappointed at Unite's stance", there were "no job losses" and workers have been offered other opportunities. Unite regional officer Lynne Shakespeare said there has only been one meeting with the council since strike action began on 30 June. The meeting took place on Thursday and Ms Shakespeare said all other meetings have been cancelled by the council. In a statement, however, the council insisted: "Our door remains open". Ms Shakespeare said union members "feel badly let down by the council" after they received notice letters on Saturday saying their jobs were no longer needed. Corporate director at the council, Jacqui Kennedy, denies this and said: "There are no job losses [...] and we have not issued redundancy notices." Meanwhile, Birmingham residents are increasingly angered by missed waste collections. One Harborne resident said her rubbish had not been collected for over four weeks. She said Baldon Road looks "disgusting" and criticised the council's response which she said was patronising and unsympathetic. "The council have no way of dealing with missed collections and no plan of how to fix this," she added. Matthew Bowater, from Sheldon, has not had his rubbish collected for three weeks and said he was "at his wits end". Raj Bansal, from Harborne, said his whole street is full of rubbish. He has a newborn baby and said "the rubbish is overflowing" so he is having to keep bags inside. He said: "If the council had more practical advice, people would be more understanding."